Factory one piece top with a plastic/vinyl window. No sewing or cutting required. Seams are heat sealed from the inside and outside. Canvas tops seams are sewn. Vinyl/plastic windows are DOT rated. Robbins tops are ready to install out of the box! Robbins tops are the preferred brand used by professionals. Robbins has a worldwide reputation for quality workmanship and precision patterns. The Fiat convertible tops have excellent workmanship, superior fabrics and attention to detail that will ensure you will enjoy your convertible top for a very long time. 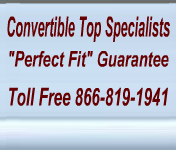 We guarantee a 100% "Perfect Fit"
for your new Fiat convertible top. How easy is this top to install? All manufacturers recommend professional installation but we have many customers who are confident enough to do the job with success. The one advantage to having a professional do the job is they are taking the responsibility for the outcome and your satisfaction. Professionals have the proper tools and experience on the first day of the job and will generally save time and money. Our tops do not require cutting or sewing and will arrive ready for installation. 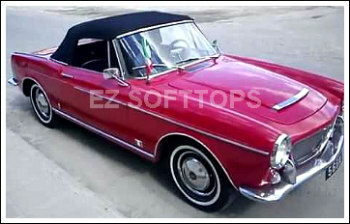 This top fits the 1960 Fiat convertible, 1961 Fiat convertible, 1962 Fiat convertible and 1963 Fiat convertible. Pinpoint vinyl is also known as "single texture". The outside is a pinpoint vinyl and the underside is cloth. This convertible top has an excellent cost/performance benefit. Weatherability is excellent and highly durable. Stayfast canvas is a three-ply composite. It is a tightly woven cloth canvas. The yarn is solution dyed before it is woven so the color is uniform throughout. Most convertibles that came with a cloth top were originally Stayfast canvas. Stayfast is more expensive than the vinyl options. This convertible top is a superior product with excellent wrinkle and U.V. resistance. Weatherability is superior and excellent durability and low temperature flexibility.